UPDATE November 22, 2012: According to news reports this morning, Eskinder Nega's appeal has been postponed until December 19th. A lawyer for another defendant noted: "As they [the Court] scrutinized our ground of appeal they found so many legal and factual irregularities." Judge Dagne Melaku has stated that the Court needs several weeks to review the "bulky" case file of evidence. 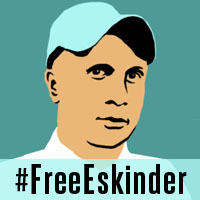 We're urging concerned individuals to use this delay to speak out -- please take the PEN America petition and show support for Eskinder on social media by using the hashtag #FreeEskinder and replacing your avatar. Eskinder Nega, an award-winning journalist who has been imprisoned for over a year, appeared briefly in court two weeks ago to appeal the terrorism charges levied against him. Eskinder has unwaveringly denied the charges, maintaining that blogging about human rights abuses and democracy is not a form of terrorism. In July, Eskinder was sentenced to 18 years in prison for his reporting. Earlier this month, his appeal was cut short: according to one report EFF received from partners working on his case, Eskinder was not allowed to read his defense statement and the appeal was rescheduled to November 22. We are continuing to seek confirmation about the status of the trial. For now, we’re asking concerned individuals to join us in calling on the Ethiopian government to live up to the promises in their own Constitution and free Eskinder Nega. While many journalists have either fled Ethiopia or been silenced by repressive policies, Eskinder Nega has become a national symbol for press freedom. Educated in the United States in the 1980s, Eskinder studied political science and economics at American University. He subsequently returned to Ethiopia where he has worked as a journalist for over twenty years. Eskinder founded 4 newspapers --all of which were shut down by the Ethiopian government --and has been jailed 9 times in the last two decades for his outspoken articles. Upon his release from prison in 2007, Eskinder’s journalism license was revoked and he was banned from working on newspapers. He immediately turned to the Internet and began using blogs to speak out. Some of his work has been published on Ethiomedia, a blog that is inaccessible from inside Ethiopia. He went back into the breach knowing full well what the risks were for doing so. He had a number of other options. He grew up in the DC area. He could have left the country, but he chose to stay. He’d been arrested 6 or 7 times before, he’s had newspapers closed down. He’s really been hounded by the Ethiopian regime. Already targeted by police, Eskinder Nega drew even more ire from the Ethiopian government when he continued to blog about the Arab Spring uprisings. Through articles like As Egypt and Yemen protest, wither Ethiopia's opposition? and Egypt's and General Tsadkan's lesson to Ethiopian Generals, Nega discussed the implications of the pro-democracy movements in North Africa and the Middle East on Ethiopia. Nega was picked up by the police in February 2011. According to a harrowing account Nega wrote afterwards, he was interrogated at length about his journalism, and the police threatened to seek retribution against him if protests broke out in Ethiopia. A few months later, he was arrested again. This time, Eskinder Nega was charged with terrorism. To understand the risk –and importance—of Nega’s work, one must first understand the status of independent media in Ethiopia. The Ethiopian Constitution promises to uphold freedom of expression, stating: “Everyone has the right to freedom of expression without any interference. This right shall include freedom to seek, receive and impart information and ideas of all kinds, regardless of frontiers, either orally, in writing or in print, in the form of art, or through any media of his choice.” But Ethiopia has a dark history of shutting down newspapers and imprisoning journalists. Immediately prior to the 1990s, there was no independent media to speak of in Ethiopia as the country struggled under a Communist regime and devastating famines. The early 1990s saw major political change in the country. Communism was ousted, a bicameral legislature and judicial system were created, and a new Constitution was written and enacted. Meles Zenawi, who would prove himself deeply aligned with U.S. interests, governed—initially as President, then as Prime Minister. While in some ways Zenawi helped Ethiopia to recover after many difficult years of conflict and deprivation, his government was marked by an intractable disrespect for human rights and press freedom. In 1992, Ethiopia issued a Press Proclamation that, in addition to other restrictions on free expression, gave the government the ability to shut down publications that printed “false” information. Ethiopia became one of the leading countries in imprisoning journalists during the 1990s, trailing only Cuba and China. In the lead up to the 2005 election, there was a brief period of improved journalistic freedom in Ethiopia. However, the aftermath of the controversial election brought a severe crack down on independent media. Even as clashes between government troops and protesters left dozens of civilians dead, law enforcement began a witch-hunt for journalists. Dozens of journalists were arrested and charged with serious crimes such as treason and even genocide. Some of these journalists faced decades in prison or even the death sentence. Along with issuing its "wanted lists," the government raided newsrooms, blocked newspapers from publishing, and expelled two foreign reporters, including a long-serving Associated Press correspondent. About a dozen exiled Ethiopian journalists were charged in absentia with treason. The U.S. government-funded Voice of America and Germany's Deutsche Welle, which broadcast radio programs into Ethiopia in local languages, were targeted by smear campaigns in state media, endangering their local correspondents…Eight newspapers were shut as a result of criminal indictments and the jailing of their top journalists. Many of the journalists who were not arrested fled the country or stopped reporting. The few newspapers that survived the purge increased their self-censorship. Eskinder and his then-pregnant wife, Serkalem Fasil, a newspaper publisher, were both arrested during the 2005 crackdown on dissent. They each spent over a year in prison. The problems with press freedom in Ethiopia are compounded because the majority of the population can't get to the open Internet, which might otherwise give them access to international news outlets. But even Ethiopians who can get online often can’t reach independent, international news. The only telecommunications service provider for all of Ethiopia is the state-owned Ethiopian Telecommunications Corporation (Ethio-Telecom), which heavily censors access to the open Internet. Tests conducted by the Open Net Initiative in September 2012 showed that online political and news sites are heavily blocked within the country. In June, EFF reported on recent increases in the censorship and surveillance practices in Ethiopia. Ethio-Telecom began deep packet inspection of all Internet traffic in the country, which engineers at the Tor Project discovered when Tor stopped working there in May of this year. In the same month, the government of Ethiopia ratified the new Telecom Service Infringement Law. This law criminalizes online speech that may be construed as defamatory or terrorist, and holds the website or account owner liable even if the speech is posted as a comment by someone else on their website. Endalk, a prominent Ethiopian blogger, has wondered if this law could be “the most creative way of copying SOPA and PIPA.” The law also tries to squash competition of VOiP services and harshly punishes citizens for using or having in their possession any telecommunications equipment without prior permission from the government. Through law and practice, through intimidation and arrest, the Ethiopian government has looked to choke off free expression at every corner. It is no wonder than Eskinder Nega is one of the few outspoken journalists still operating inside Ethiopia. While we are unable to receive direct reports from Eskinder about his current physical conditions, our knowledge of the prison system in Ethiopia leaves us gravely concerned. Prison and pretrial detention center conditions remained harsh and in some cases life threatening. Severe overcrowding was common, especially in sleeping quarters. The government provided approximately eight birr ($0.46) per prisoner per day for food, water, and health care…Medical care was unreliable in federal prisons and almost nonexistent in regional prisons. Water shortages caused unhygienic conditions, and most prisons lacked appropriate sanitary facilities. Even though the cables noted that much of the torture occurred in police station detentions, the threat of torture in the Kaliti Prison (where Eskinder is being held) is still possible. We are deeply concerned about the physical condition of Eskinder. Freeing Eskinder Nega will help preserve a vital voice for independent journalism in a country that hungers for access to truthful news coverage. It will also serve as inspiration for activists working to free other imprisoned journalists in this country. The Ethiopian government has released journalists in the past—including Eskinder, several times. Earlier this year, it released and pardoned Swedish journalists Johan Persson and Martin Schibbye after substantial international pressure. And in August, Temesghen Desalegn, editor of a leading independent weekly newspaper in Ethiopia, was released and cleared of the criminal charges against him. So we know that activist efforts – including international pressure – can be persuasive to the Ethiopian government. If nothing else, continued international attention can help ensure Eskinder Nega’s safety as he continues to appeal his case. • Sign PEN American Center's petition, which automatically sends an email to Prime Minister Hailemariam Desalegn and Minister of Justice Berhanu Hailu. • Send appeals by mail to Ethiopian officials and their local Ethiopian Embassy or Consulate. We’re also going to be changing the EFF Twitter profile image to show a #FreeEskinder banner leading up to Eskinder’s next appeal. We hope you’ll do the same to your own online accounts by using the image located here. The United States has deep ties with Ethiopia, which is a major military ally for our country in sub-Saharan Africa. EFF is writing an open letter to the US State Department to urge them to speak out on Eskinder’s case to Hailemariam Desalegn, Ethiopia’s new Prime Minister. As the Washington Post stated, Eskinder’s case is “a source of tension and embarrassment to the Obama administration,” whose new Africa strategy makes democracy promotion the number one priority. We’ll be watching Eskinder’s case closely in the coming months. Follow us on social media and sign up for our newsletter to stay up to date on the campaign.